where s(s,t) is total number of shortest paths from node s to node t and sv(s,t) is the number of those paths that pass through v.
according to the pagerank """
This graph is pretty interesting, indeed it highlights the nodes which are very influential on the way the information spreads over the network. 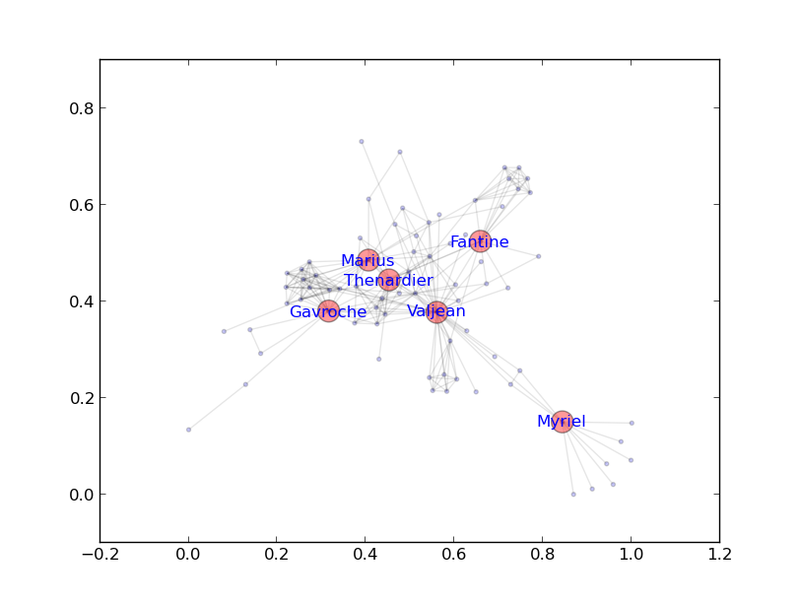 In the sample network we used each node represents a character and the connection between two characters represent the coappearance in the same chapter of the book 'Les miserable'. Looking at the graph we can easily say what are the most important characters according to the Betweenness Centrality. We can also observe some interesting situations like the ones of Valjean and Myriel. They are to connected to groups of characters who don't have a direct connection with the main ones.